“Sports Potpourri” author Mac Stevenson passed away on Aug. 28, following complications with surgery. Mac Stevenson loved Kansas and sports — basketball, football, golf, hunting, baseball, boating and fishing. In years past, he was known to have had three television sets blaring at the same time so he could watch three separate football games. 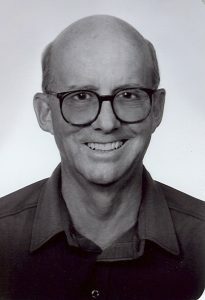 He wrote a weekly sports column for a number of Kansas newspapers. And never one time in his twenty-eight years of writing his column, “Sports Potpourri” , did he miss the deadline of publishing his sports news for all of you to read. Under different circumstances, he might have been a Grantland Rice, a Red Smith or a Frank Deford. He also wrote three unpublished novels which someday we may publish. Mac Stevenson died on August 28, 2018 at Salina Regional Medical Center following complications from surgery. He was born on November 10, 1934 in Salina, Kansas. He was a Kansan through and through attending the University of Kansas, graduating in 1953. He was a Jayhawk fan and also became a Kansas State Wildcat fan when he moved to Manhattan, Kansas, where he owned The Stevenson Clothing Company which was founded in the late 1890’s by his grandfather, William McBride Stevenson, thus his name, Mac. He lived in Manhattan from 1953 until his return to Salina in 1986. He not only wrote about sports, he was a sportsman. I was witness to many of his sporting accomplishments. I remember many pitch black fall nights. He would be out shooting baskets at a hoop attached above the garage. He had installed two bright spotlights and spent hours and hours shooting and shooting. I watched him end the session by drinking an entire quart of whole milk from a glass dairy bottle, then flex his muscles. He lettered in football, basketball and golf at Salina High School. Another time on a blue- gray Thanksgiving morning, Mac and his brother and brother-in-law set out for his grandfather’s farm for an early hunt for pheasants and or quail. They plodded through the muddy fields for several hours seeing nary a bird when they discovered the missing car keys. They were fifteen miles from the waiting Thanksgiving feast which was delayed for several hours. He tried skiing one time! The Vail, Colorado ski area had just opened in the early 1960’s. The trails had been named but not yet marked with signs. He and his group rode the chairlift up, not knowing where they were going. They ended up on a later- named slope called, “The Tourist Trap.” That was not a misnomer, it was aptly named and a deadly steep slope. He ended his first attempt at skiing trudging down the mountainside with his skis slung over his shoulders. There was a wheat field right behind the house where he grew up. His black and white curly- haired water spaniel named, Vick, short for Victory, following World War II, would leap and bound and tear around in circles when he brought his shotgun out of the gun closet. The two would head out into the wheat field. Hours later they would return, sometimes empty– handed, sometimes with the doves he had shot. His mother would make a scrumptious dove and wild rice dinner unknown to the food kingdom. Mac was an excellent golfer and had hundreds of golfing friends through the seventy-five years he played the sport. He shot a seventy-eight less than a year ago and was very proud of shooting that low score in his eighty-third year. He added that he had teed of from the closer tees which is allowed on many golf courses when you reach the age of eighty. He spent twenty or more summer vacations in Ludington, Michigan at the family cottage, MACEVEDAN. His grandmother named the cottage after her three grandchildren, MAC, EVE, and DAN . Everyone bungled pronouncing the name. He had a rowboat, a jon boat, to which he attached an electric trolling motor. On one occasion, he and his children Martin and Jeanne were at the Lincoln River Channel and he was attaching the new batteries to the boat. He toppled head first into the channel waters. The batteries landed in the boat . He loved a painting of a sailboat in a blazing red, orange and yellow sunset that was at the Michigan cottage. The inscribed poem, “Tis the Set of the Sail,” by Ella Wheeler Wilcox was printed at the bottom of the picture. So, now dear friends, you know a bit more about Mac Stevenson, your friend of many years or your friend through “Sports Potpourri.” Many of his greatest pleasures were the contacts he had with each and every one of you. So, now his game is over. He played in all four quarters. He will be greatly missed.